Programme notes for the Royal Ballet performance of Live Fire Exercise, collaboration between John Gerrard and Wayne McGregor, May 2011. The art of dance has always been recognized as one of the most honest and necessary for the training of the body, and as providing it the most fundamental and natural disposition to all sorts of exercise, the bearing of arms included; and consequently one of the most advantageous and most useful to our noblility, and others, who have the honour of serving us, not only in armies in wartime, but also in peacetime in the amusements of our ballets. – Louis XIV, Founding letters patent of the Academie Royale de Danse, 1661. To survive and surmount years of disciplinary preparation and seasons of even more arduous performance requires rigid determination and almost mindless self-abnegation. Wayne McGregor’s new work has been developed by the choreographer in collaboration with artist John Gerrard. Combining an innovative artform with equally radical choreography, Live Fire Exercise prompts some complex questions about power, theatricality and military force in contemporary society. Gerrard’s work uses sophisticated computer technology to create realtime ‘portraits’ of found structures in the landscape – vast, empty scenes in which stand oil pumps, intensive agricultural facilities, and most recently a Cuban school built using imported Soviet technology. Digitally reconstructed as 3D models, around which a virtual camera viewpoint slowly orbits, these eery, depopulated edifices speak of a violence that operates silently in distant non-places, beneath impassive, anonymous exteriors. What Gerrard’s works ultimately depict are modern and post-modern technologized ‘landscapes’ of power. For their collaboration Gerrard used as reference material US Army photographs of military operations in a remote Dijbouti desert. 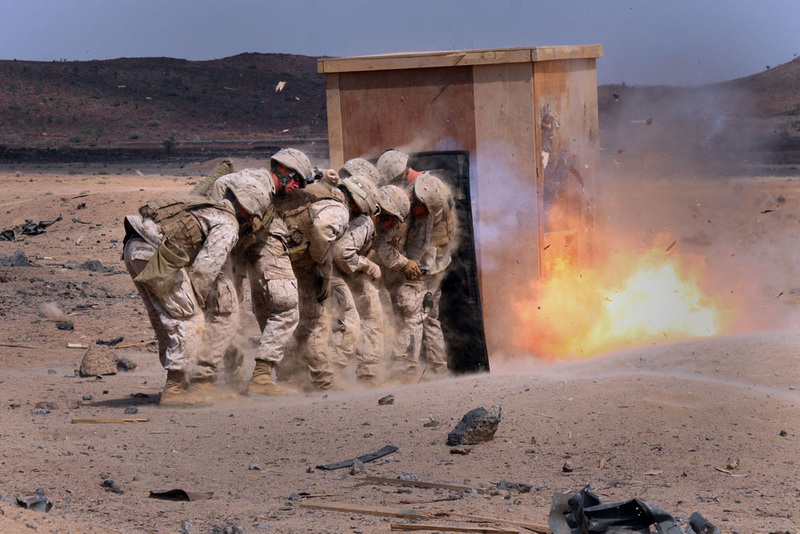 The images document an exercise intended to prepare troops for the physical impact of mortar rounds or roadside bombs: We see two columns of soldiers deliberately subjected to the force of an explosive charge; captured at the moment of detonation, the soldiers’ bodies are distended by the blast, reshaped by the forcefield of war before the campaign has even begun. In the wake of World War I, Sigmund Freud worked with shellshocked soldiers, observing how in dreams and other symptoms they replayed or repeated traumatic experiences in manageable portions. Apparently striving to master the overwhelming events, their dreams functioned not as fantasised realisations of desire, but as episodic discharges of trauma. The exercise documented in these photographs seems to reverse this sequence, a calculated exposure to risk subjecting the troops to a staged ‘pre-shellshock’ in order to buffer the inevitable contingencies of action. Here, the symptoms precede the trauma. In other shots we see men frozen like toy soldiers, taking up formulaic poses of battle-readiness, or made up with movie prosthetics as casualties for battle simulations. Intrigued by this strange blurring of theatre, cinema and reality, which drills soldiers for the contingencies of war but also functions as a media spectacle, Gerrard asks what these bodies make legible about the nature of power today. But it was the Sun King who most explicitly employed ballet as a strategy of power: Louis XIV’s founding of the Académie Royal de Danse in 1661 codified and regulated dance under the strict surveillance of the Crown, establishing it as a body of knowledge and appointing masters to assure discipline and proper training. In its charter, the King explicitly reminds us that dance also serves to keep peacetime bodies prepared for bearing arms. Thus, however autonomous ballet may since have become, its has its early-modern roots in a kinship with the art of war and the maintenance of sovereign power. This new alliance between the virtual landscape of military power and McGregor’s exploration of the virtualities of the body also called for a reappraisal of the classical theatrical apparatus – another arena in which theatre, warfare and power have been knotted together, notably during Da Vinci’s career under Sforza in Milan, where the polymath’s workshop turned out sets and innovative stage devices as well as military machines. As McGregor explains, for LFE, the stage has been ‘desertified’: ‘We’ve taken away the wings and the flats, so that the dance floor expands almost to the external walls. You are left with this massive space, with some of the structural armature of the theatre exposed. It changes the temperature of the stage rather significantly. You’re no longer trying to disguise anything or create a seamless theatricality. What’s there is there, on show and visible.’ Here McGregor references the stripped-down ascetic beauty of Frederick Ashton’s 1946 Symphonic Variations. Ashton’s first abstract piece produced by the Royal Ballet, Symphonic Variations removed all unnecessary detail, decoration and storytelling to focus attention solely on the dancers themselves – an ‘exercise in physicality without obvious meaning or narrative’ that McGregor is happy to see as a precedent.